Founded in 1959, by John Kendrew, the Journal of Molecular Biology was the first journal devoted to this new and revolutionary science. To celebrate the thirtieth anniversary of the Journal, the current editor, Sydney Brenner, has selected a number of papers from the first hundred volumes. 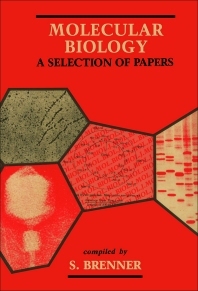 They include the seminal papers on genetic regulation by Jacob and Monod and on allostery by Monod, Changeux and Jacob. Also included are many important papers on structural biology and molecular genetics and papers reflecting the initial developments in DNA cloning and sequencing. Of value to all biologists with an interest in the molecular basis of living systems, the book is a personal selection by the Editor. Readers are encouraged to compare it with their own choice from the Journal of Molecular Biology. Institute of Molecular Scieces, Berkeley, Califoria, U.S.A.